After you purchased the Bundle-Plugin in our store, you can install it like other plugins too using the Plugin Manager. After the installation the plugin wants to clear different caches, we recommend to do this instantly to use the plugin directly. Aftger clearing the caches, please reload the backend. Exclude percental vouchers for bundle: If active, the customer can't add percental vouchers to the cart, when he has a bundle in his cart. Here the customer has to use general vouchers or delete the bundle. Take bundle discount into account whe calculating voucher: By default, percental vouchers are calculated using the item value. Surcharges and discounts are normally excluded. When you activate this option, the bundle discount will be included to the discount calculation to prevent duplicate discounts. Show bundle below product description: If you activate this option, the bundle is displayed below the item description. Mark bundle products in the listing page: Activating this option, bundle items are displayed with a little badge in the frontend. Open the item, which you want to sell in a bundle. In the item detail window, open the tab "Bundle", here you will find all settings to create a bundle. Add bundle (1): With this button you can add a new bundle. Delete all selected (2): Delete the selected bundles using this button. Bundle list (3): Here all bundles are shown, which are created from this item. Bundle name (4): Give your bundle a name here. This name is shown in the bundle list after saving. Show bundle name (5): When you want the bundle name to be shown in the frontend, activate this option. Bundle type (6): Chosse between "Normal bundle" and "Selectable bundle". With a normal bundle the customer can only buy the whole preassembled bundle. With a selectable bundle the customer can decide, which articles of the bundle he wants to buy. Discount type (7): Choose between "Percentage discount" and "Absolute discount"
The percentage discount will subtract a percentage value from the price, e.g. 15%. The absolute discount will subtract an absolute value from the bundle price, e.g. GBP 15,-. Active (8): Set this checkbox to activate the bundle. Bundle order number (9): The bundle order number must be assigned manually, this is the order number of the bundle discount, which will be cleared in the cart. Position (10): This defines the order of the bundles. if you have multiple bundles for one item, this will set the position in the display order. Display products globally (11): Here you can set, wheather or not the bundle should be shown just on the item you are creating the bundle for or at all involved item detail pages. Show delivery time in the bundle (12): Here you can set, which delivery time should be shown at the bundle. Individually for each product: This will display the delivery time for each prodict seperately. Only the longest: This displays only the longest delivery time for all products. Only the longest and individually for each product: This displays the longest and each individual delivery time the same time. No displaying: No delivery time will be shown. When a product has no delivery time set, the default snippet "DetailDataNotAvailable" from frontend/plugins/index/delivery_informations is shown. This value will also used for the longest delivery time, no matter if other products have a longer delivery time. Limited (13): If this option is activated, the bundle is only displayed in the frontend, when It is in stock. Stock (14): Here you can set an individual bundle stock. If your item has a stock of 50 and you want to sell the bundle only 20 times, just enter 20 here. After selling the 20th bundle, it will disable automatically. Valid from / to (15): Here you can enter the time frame the bundle should be active in. Add product (1): Using the search you can add prducts to your bundle, you can search the products by name or by order number. Quantity (2): Enter the desired quantity for the added product here. 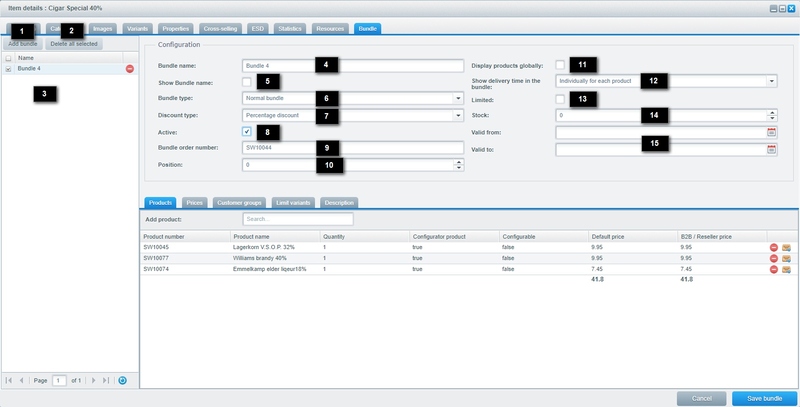 Configurator product and configurable (3): Here you can edit, wheather or not the customer can choose from all variants of the added product. Prices (4): This is the price of each product and the sum of the whole bundle for every customergroup without any discount. Action buttons (5): Using this buttons you can delete the desired product from the bundle or open its detail window. Add price (1): Choose a customergroup from the dropdown to set a price for it. Product price (2): This means the price on the whole bundle without any discount. Discount (3): Enter your discount here. Depending on the bundle type (normal or percental) this field will act as an absolute or percental discount field. End price (4): This shows the calculated bundle price in your current default currency. Add customer group (1): Use this dropdown to add a customer group, which should be able to buy the bundle. Customer groups (2): The selected customergroups will be able to buy this bundle. Add variant (1): When your main product is a variant product, you can add the variants here, for which the bundle should be available. Product number (2): Here are all variants listed, for which the bundle is active. If you don't have a variant added, the bundle is active for all variants. Additional text (3): Here the variants additional text is displayed, so that you can directly see, which variant it is. Here you can enter a description for your bundle, this description is displayed in the frontend. Using the product bundle overview you can directly see all your created bundles. You can find the product bundle overview in the backend under Items > Product bundle overview. 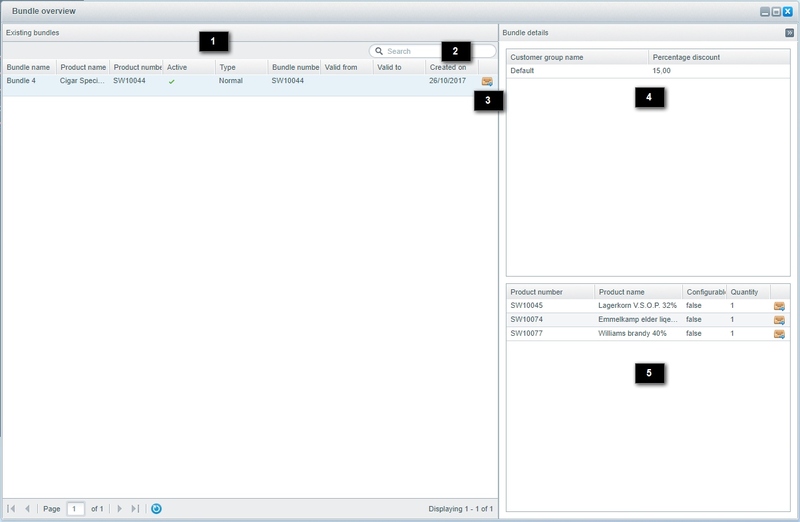 Existing bundles (1): In this overview you can see all exisiting bundles with their most important information. This module is not able to edit this bundles, it's just an overview. You can click a bundle to see further details on the right hand side. Search (2): If you have a lot of bundles you can use the search to find your desired bundle. Edit (3): Using this button you can open the product to edit the bundle. Bundle prices (4): After selceting a bundle you will see the customer group prices for this bundle here. Bundle products (5): After selcting a bundle you will see all bundled products.Clicking the little buton on the right you can edit this product. 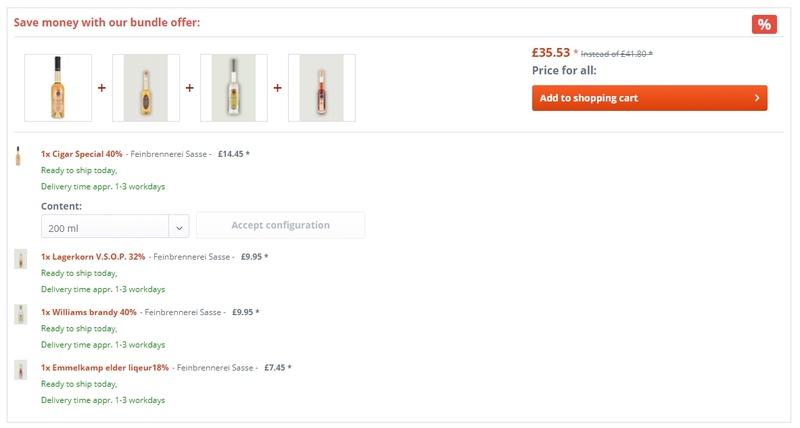 Bundles cannot combined with products which have an activated pricegroup. Liveshopping prices will be ignored at buying a bundle. The bundle will always use the default product price. When products with different VAT rates are combined, the VAT will not be designated correctly. We recommend to not bundle products with different VAT rates.